So I didn’t jump at Manning Marable’s biography even if it did win the Pulitzer for history in 2011 – I figured I pretty well knew what was in it – wrong. Marable has written an exceptionally well-researched and finely readable book about this enigmatic and charismatic leader, thinker, speaker, preacher, and activist for Black, Civil and Human rights. Unlike many biographers, Marable, an historian at Columbia for many years, never falls in love with his subject, he points out Malcolm’s flaws and foibles as well as his strengths and accomplishments. And there are many examples of both. The focus seems to be on his changeable ways (hence the title) – his multiple masks. 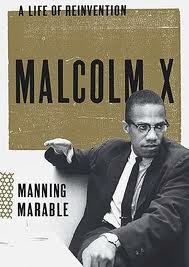 But according to Marable Malcolm X was a master of reinvention – this is reiterated over and over. Malcolm ideas grew and changed as he became more well known – particularly after his visit to Africa. He became political as much as religious leader, something that irritated some of his peers in the Black Muslim movement as a whole – perhaps to the point of murder? Marable limns the strains between the Nation of Islam under Elijah Muhammed and himself, splitting away, developing a new organization and finally working for human rights – internationally. Malcolm’s less than pure Islamic home life is detailed – and moderately interesting – it fills out the whole man. Some surprises – among other things, that his criminal record was not nearly as bad as he made out in the Haley book, and that Malcolm X had a homosexual relationship for several years. Marable offers his own ideas about the shooting.